3 Kids, 2 Jobs, 1 Life: Bang Bang! Caroline and I had haircuts last night (yes, LAST night and not Tuesday night - I screwed up the schedule AGAIN. Seriously, since we've been in the house selling process, my mind is seriously slipping.) and she mentioned the day or two before that she might want bangs. I think she had seen a photo of herself when she was younger with bangs and braids. She's been very into the "two braid" look lately for some reason and thought bangs would look good. When we got to the salon and she got up in the chair, she told Pam (our stylist) what she wanted. Since I believe that things like hair are NOT a big deal and that it will always grow out, I will never tell my kids how they have to have their hair but I did make sure that's what she really wanted. Pam said she was happy to do it and would do thin ones so that if she didn't like them it would be easier to grow out - but she also pointed out Caroline's little cowlick that runs through her bangs and always made them stand up when she was little and had bangs previously. Caroline didn't seem to care and we went forward with it....she was THRILLED! Thrilled! Clearly most women have had bangs at some point and have been through that inevitable growing out stage but I think everyone has to go through it themselves. I had bangs until my sophomore year in high school, grew them out and then cut them again my senior year (after photos). Then I grew them out again sometime in college and then got them again when Caroline was a baby. That was VERY short lived and I grew them out at the end of my pregnancy with Bryce....and never again! I'm done with bangs. Although on Caroline, I think they are adorable. I do think they make her look younger but clearly that does not bother me. 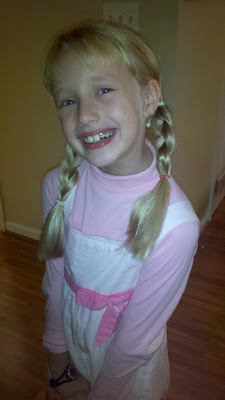 Wearing them with braids makes her look like Anne of Green Gables (with blond hair) which I think is pretty cute. Of course now she wants an American Girl doll that has bangs since Emily (her AG doll) does not have them.